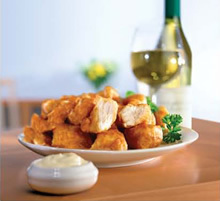 Westbridge Coated and Fried chicken pieces are produced with whole chicken breast, marinated, coated and fried before being fully cooked and then individually quick frozen. The range is extensive and is primarily whole muscle products. Our range of Coated and Fried products can be found in both bulk industrial cases and a foodservice convenient "Easy Cookin" branded wholesale packs.